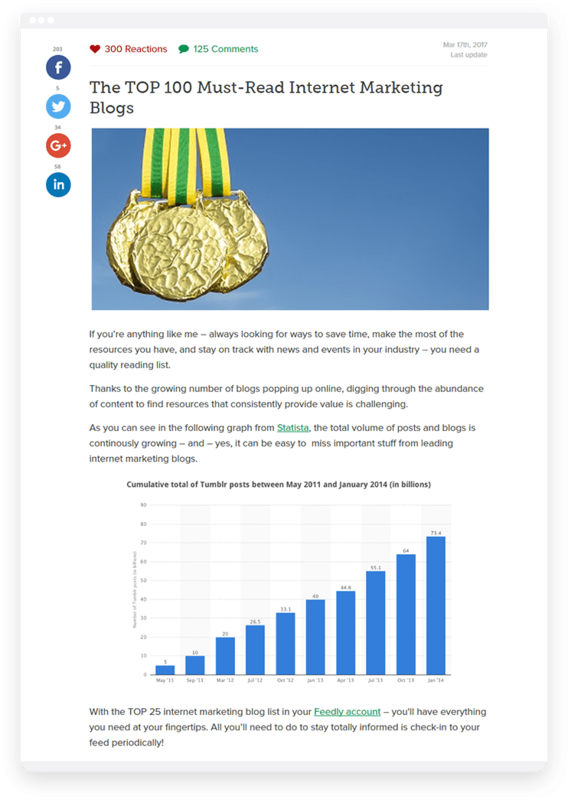 Epic blog post with legendary resources in your industry that drives social shares and backlinks. We research your industry using tools like SemRush, BuzzSumo, and Alltop, then pick websites that provide the most value to your readers. Once the top list is live on your website, we reach out to influencers in your niche to let them know that they’ve been mentioned and ask to share your content. 1. Agree on Topic We brainstorm ideas for blog posts and agree on the best one for you. 2. Research the Best Websites We research the best websites in your niche that will be included in the Top List. 3. Write Top List We craft the Top List for you. 5. Reach Out To Sites Mentioned In The Post Once the post is live on your website, we reach out to influencers mentioned in the post and ask them to promote.